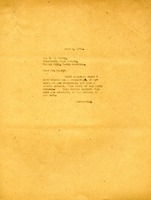 Letter to R. W. Madry, from the new bureau of the University of North Carolina at Chapel Hill, from Martha Berry informing him that she sent him a picture of herself as he requested as well as a booklet "The Story of the Berry Schools"
Bartholomew acknowledges Berry's note about the Three Arts Club scholarship. She expresses appreciation for her recent visit as a Pilgrim, although she was surprised to find that Berry was not able to sing the school songs. She requests copies of several publications to send to friends and commits to accomplishing "something worthwhile" for Berry within the year.